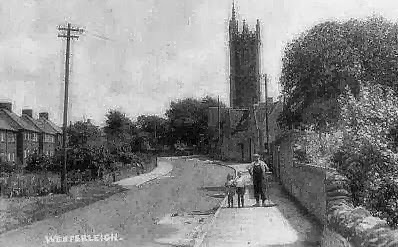 Westerleigh has its origins in Saxon times, having been mentioned in a document dating from 887. In 946, the village was given to the Monks of Glastonbury to pray for the soul of King Edmund who was killed at Pucklechurch. At this time it was probably just a clearing in the woods with possibly a wooden church built on the site of the present one, and yet it warranted an entry in the Domesday book of 1086. In the middle ages the village grew in the Medieval fashion of a green with the houses and church clustered around it and became quite prosperous, as shown by some of the more elaborate gravestones and by several large houses from this period. The northern wall and porch of St James church is from the 13th century, as is the pulpit which is richly carved and one of the few stone pulpits left in England. The remainder of the church was destroyed and rebuilt in the perpendicular style, with the striking tower (once used as the village lock up) added at a later date. The 700th anniversary was celebrated in 2004. By 1600 the village supported a shoemaker, a blacksmith , a sawyer, a flour mill, a malt house and two public houses, both brewing their own beer. The Kings Arms (now Ye Olde Inn) housed a contingent of Yeomanry who exercised on what is now the sports field. In 1617 / 1618, John Crandall was baptised at St. James the Great, and subsequently became one of the founders of Westerly, Rhode Island USA (A group of his descendants has recently visited our village). The discovery of coal in 1660 made a big difference to village life, and further finds at Coalpit Heath and Parkfield provided employment for many years until eventual closure last century, when the seams were exhausted. In the late 1700's roads were built to Downend and Yate, and the Great Western and Midland railways were constructed in the 1800's. Westerleigh junction was of some importance as the crossing point of east-west and north-south main lines, and is often included in historical railway books. 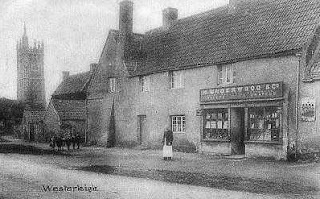 By 1876 there were still a varied assortment of occupations in the village, including farmers, a bootmaker, shopkeepers, innkeepers, butchers, a plasterer, a blacksmith, a wheelwright, a market gardener and a carrier, but these trades began to die out and at the end of the century many of the old houses were demolished. At the beginning of the 20th century, the railway and mining provided most of the work, but since then the village has begun to expand with residents finding employment nearby in Yate and Bristol, and in the many small businesses that have become established in recent years.